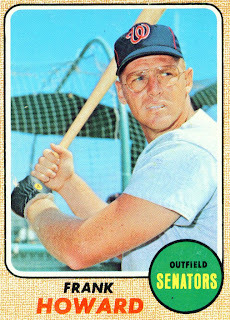 Texas Rangers Cards: Senators Saturday - Frank Howard, 1968. Senators Saturday - Frank Howard, 1968. Frank Howard had shown flashes of what was coming in 1968 but that year was the the start of his reign as Washington's undisputed power king. Here we see Frank on card number 320 of the 1968 Topps set. As the team's starting left fielder in '68 Frank appeared in 158 games. He logged 1,337.2 innings in the field, the majority in left field although he did play some first base. He handled 655 chances in that time and made 19 errors for a .971 fielding percentage. That was below the league average. At the plate is where Hondo really shown. In 1968 he had 663 plate appearances. 54 of those he worked for walks and 164 for hits. His .274 batting average was top in the Senators' starting lineup and his .338 on base percentage tied for the top team mark. He also led the team in home runs (44), RBI (106), doubles (28), runs scored (79), total bases (330) and slugging percentage (.552). His 141 strikeouts were also the most on the team. Frank's home runs, total bases, and slugging percentage led the league as well as the team. His RBI were second in the league. That resulted in an All-Star appearance, Howard's first. The Senators may have gone off the cliff in 1968 but Big Frank Howard was just hitting his stride. The future looked bright for the bespectacled big leaguer. 1973 Topps - Bill Fahey. 1986 ProCards - Jeff Kunkel. 1973 Topps - Rico Carty. Senators Saturday - Ken McMullen, 1968. 1986 ProCards - Jim Maler. Senators Saturday - Tim Cullen, 1968. 1986 ProCards - Greg Tabor. 1973 Topps - Jeff Burroughs. Cards from heaven or Anaheim? Senators Saturday - Ed Brinkman, 1968. 1973 Topps - Pete Broberg. 1986 ProCards - Don Werner.